In March of 2014, Sony announced it would stop supporting its impressive line of AIBO robot dogs, leaving many owners heartbroken. Countless toy companies have tried to create similarly capable robot pets since AIBO’s demise, but they’ve all been a disappointment—until now. Despite being a Star Wars toy, Spin Master’s new life-size BB-8 might just be the zero-maintenance pet you’ve always wanted. Originally announced at Toy Fair 2016, Spin Master’s BB-8 was just a prototype a year ago, with limited functionality. It was supposed to hit store shelves during the holidays last year, but the company decided to delay its release until 2017 to improve its capabilities, including a redesigned remote. 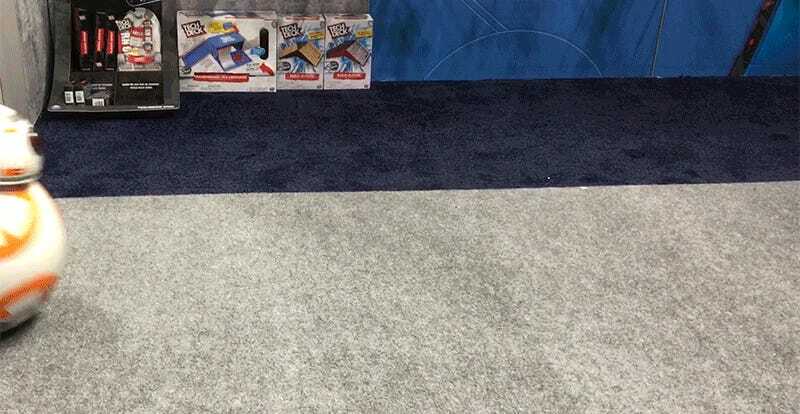 We finally got a chance to play with the little droid at this year’s Toy Fair, and walked away wishing it could follow us all the way back to our offices. The Spin Master’s version is a spot-on recreation of the droid from Star Wars: The Force Awakens, and it comes across as incredibly life-like in comparison to the film’s version. BB-8 ‘speaks’ using the same beeps and whistles used in the The Force Awakens, and reacts in different ways to various words and phrases. When you say “Kylo Ren”, for example, he backs away in fear. The BB-8 prototype we saw last year used a Wiimote-like controller with a single joystick on it for manually controlling the little droid. But that has since been replaced with a more traditional-looking double joystick controller that now uses wireless RF for improved range. What Spin Master didn’t change was BB-8's ability to autonomously follow anyone carrying that controller around, making the droid feel like an affectionate puppy that always wants to be near you. 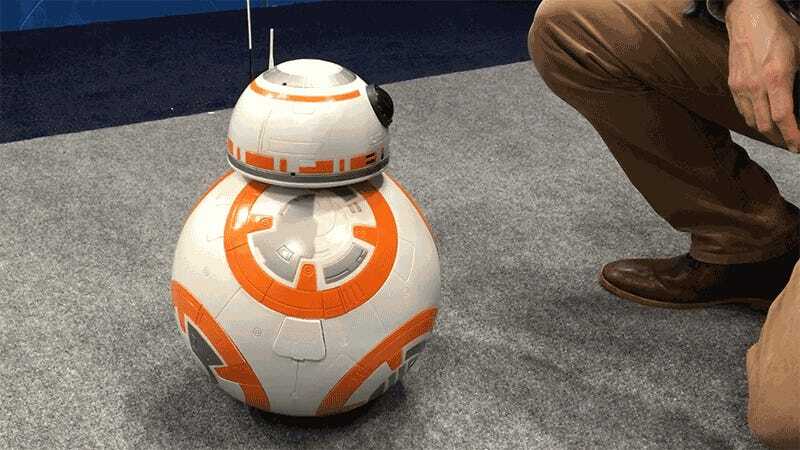 Given Sony’s AIBO cost thousands of dollars when it was originally introduced in 1999, Spin Master’s $230 BB-8 is lacking some of that robot pet’s more advanced features. 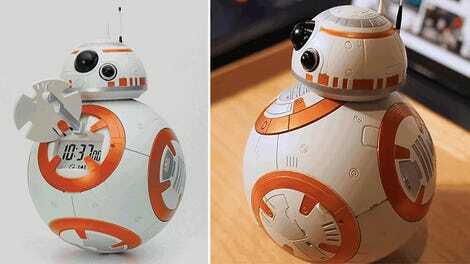 Instead of automatically returning to a charging dock when its batteries run low, you’ll need to plug in both BB-8's body and head at the same time, which sounds like a bit of a hassle. And like with other rolling BB-8 toys, you’ll have to occasionally stomach the trauma of this BB-8's magnetically-attached head popping off in a collision. 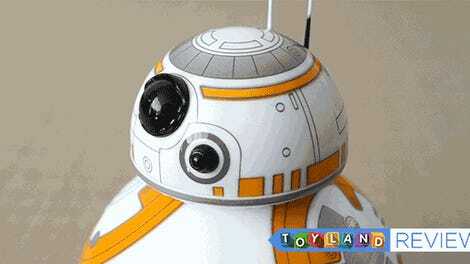 Although Spin Master wouldn’t confirm a specific date when its Star Wars Hero Droid BB-8 will finally be available, they also didn’t deny that, in all likelihood, you’ll be able to get one on September 1, 2017, when Disney and Lucasfilm open the floodgates for all of the Star Wars: The Last Jedi merchandising. Your bank accounts have been forewarned.